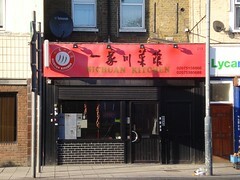 Sichuan Kitchen was a Chinese restaurant in Poplar. According to Google Street View, it closed down in 2017 and was replaced by another restaurant called Han Restaurant. Chinese restaurant in Poplar, specialising in Sichuan food. They also do Chinese hotpot. Kake and friends (including a toddler) visited on a Wednesday evening in June 2014. We'd booked, but it was fairly quiet throughout our visit anyway, and indeed when we arrived a little before 6:30pm we were the first customers. Peaceful music was playing, not too loud. Szechuan savoury hot spicy chicken (口水鸡/"mouthwatering chicken"; £7.80) photo was OK, but the sauce didn't have quite the required complexity of flavour. Crushed cucumber in garlic sauce (蒜蓉黄瓜; £4.80) photo was crisp and refreshing, though not incredibly garlicky. Home-style fried tofu with sliced pork (家常豆腐; £7.80) photo had a well-flavoured sauce that had soaked in nicely to the tofu pieces; the spring onions in the dish could have done with more cooking, though. Sea spicy aubergine with minced pork (鱼香茄子; £7.80) photo was nicely savoury and not too oily; this was perhaps one of the better dishes we ordered. Sliced pork Sichuan style with chilli and Sichuan pepper (水煮肉片/"water-cooked pork"; £8.80) photo was disappointingly lacking in both chilli and Sichuan pepper; the pork pieces were also small and raggedly cut. Chengdu dan dan noodles with minced pork (四川担担面; £4.80) photo were also lacking in Sichuan pepper, and the pork content was fairly sparse. Stir-fried tong choy with garlic (空心菜蒜蓉; £7.80) photo was fine. We also asked for plain rice for five people (£2/person); they initially only brought us a small amount but were happy to give us two top-ups at no extra charge. A bottle of white wine was £16.50, and green tea was £1/person. A 10% service charge was added to the bill photo. Service was fine, and staff were friendly towards our toddler. Kake's verdict: I was somewhat disappointed, particularly as I'd heard good things about this place (see the Chowhound thread linked below). I do wonder if they toned down the flavours because none of our party were Chinese — or perhaps there's been a change of chef since the Chowhound report. Child-friendliness: They have at least one highchair. No obvious baby change facilities. Accessibility: No steps to get in, but most of the seating is down two steps, and the toilets are down a flight of stairs with a handrail on one side most (but not all) of the way down. Last visited by Kake et al., June 2014. Last edited 2019-02-17 13:12:39 (version 3; diff). List all versions. Page last edited 2019-02-17 13:12:39 (version 3).